We are updating several plotting videos we use in our online courses, which were pretty good twenty years ago, but pretty clunky by modern standards. We start out here with a compilation of text descriptions to short videos. For the time being, these are just YouTube videos of the old Flash movies. We will redo them from scratch in the near future. (1) Set divider tips to span the distance. (2) Move the dividers to the miles scale with one tip on 0 miles to get the approximate distance. (3) Then slide the other tip to the nearest integer on the scale, and read the fractional part from the tip that was on 0. Miles scales will appear on most charts with scales of 1:80,000 or larger. When no miles scale is given, use the Latitude scale for the miles measure. Each minute of Latitude equals 1 nautical mile. When using electronic charts, the display software will typically include an option on the menu bar for measuring ranges and bearings. With these functions, you just drag the mouse cursor from one point to the next and the distance between points and the bearing between them show numerically on the screen. We will measure the distance between the two points marked by these fingers. The dividers used are a speed bow, which we adjust with the knob between the two points. We are measuring the distance from a channel marker buoy to a daymark at the entrance to a channel. Once the dividers are accurately set to these points, we move the dividers — with out changing their separation — up to the miles scale, which in this case was at the top of the chart. It could be anywhere on the chart. Notice that we first put left tip on the 0 and look to the right tip to see that we have here a distance of just over 2 and one half miles (nautical miles). Next slide the dividers to the left until the right tip is exactly on the 2, and read the fractional part from where the left tip hits the tenths scale. Count out the number of tick marks from the 0 back to the left to see that the fractional part is about 0.64. The total distance is then 2.64 nautical miles. (2) Move the dividers to the latitude scale on the left or right side of the chart, roughly due east or west of the segment you are measuring. (4) Let the other divider tip fall onto the latitude scale wherever it might. The second tip can be at a higher or lower latitude that the first since we care only about the distance between them. (5) Figure the distance using the rule that each minute of latitude equals one nautical mile. Always double check the latitude scale to be sure you understand what the tick mark or graduation marks mean. Sometimes the latitude scale is marked in tenths of minutes, other times in various units of arc seconds, such as a mark every 5". The latitude scale can be used for a miles scale on all charts, even if they happen to have a specific miles scale printed on them. Remember to go more or less straight left or right to reach the latitude scale — and that this must be measured from the latitude scale (sides of the chart), not the longitude scale (bottom and top of the chart). That is, do not set dividers to some distance near the top of the chart and then put them on the latitude scale near the bottom of the chart. 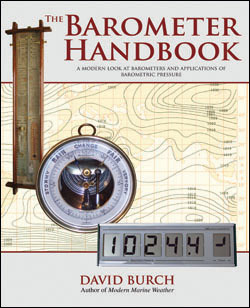 On a small scale chart which covers a large area, if you make a shift like that you can introduce significant errors in the distance measurement. A note on the reason for this: Nautical charts are made in what is called the Mercator projection. This type of projection is very convenient for navigation since North is always the same direction on a chart — usually toward the top of the page — and all bodies of land and water have the proper shape. This latter point is important since it lets us determine what the compass bearing is from one point to another from the chart. This seemingly obvious task is not so simple as it might seem. Near the North Pole for example, or at any very high latitude, this type of chart (Mercator) is not possible and consequently it is difficult to determine bearings or directions from a chart in these areas. Remember if you are standing at the North Pole, every direction is South! — a good hint that we have a charting problem in this region. In any event, away from the polar regions, Mercator charts serve us well for navigation, but there is a price to pay for the bearing convenience. Although the shapes of lands are right, their relative sizes are not. Greenland is not larger than the US as it appears on a Mercator projection, it is in fact less than one quarter the size of the US. So it is with all land masses on Mercator charts. They are bigger at higher latitudes. Put another way, the number of inches per degree of latitude or per nautical mile is higher at higher latitudes. It is always true that 1 minute of latitude = 1 nautical mile, but the physical size of this unit will vary with latitude. That is why when using small scale charts (those that cover a large area) we must use the nearest latitude scale to measure distances. This is the same measurement explained in the previous example (Short line with miles scale), but this time we use the latitude scale to read the miles. If you have not done so, please read through the previous example first. After setting the separation, we move the dividers straight left (or right) to the nearest latitude scale along the side of the chart. Here we set the top tip to the latitude of 37° 20' N and let the bottom one fall where it will. We chose this one simply because it was the nearest whole value due west of our measurement. This particular latitude scale is marked with broad bands every 1' of latitude. Although the numbers are not shown, the bottom tip is at latitude 37° 17.4' N.
What we care about here, though, is only the separation, which we can count down from the 20' mark to see that it is 2.6' = 2.6 nautical miles. In this very common operation of reading a latitude, or in this case a latitude interval, it is very important that we first check to see what the tick marks mean along the scale. Don't guess this, always double check it. Different charts use different conventions on what is bold and how many minutes or seconds there are per tick. (2) Start at the first point and "walk" the dividers along the route, counting the total number of steps. (3) At the end, squeeze the divider tips together to measure the last, smaller step. (4) Take dividers back to the lat scale or to a miles scale to measure the size of the last step and add this to the total number of steps for the full distance. This is the standard method for measuring longer distances. In most cases, you must balance out the best choice for the step size. If it is too large, you will lose accuracy going around corners, but if it is too small it takes longer to measure. On electronic charts, this measurement is typically done by setting up a route of multiple waypoints between the two end points. Then the route properties can be displayed which among other data will include the total distance from start to end. Such a route could be temporary or saved. The properties will include the bearing or course between waypoints as well as the time of transit based on some input speed. This procedure can also be used to measure or estimate the time a trip will take. If traveling at 7 knots, set dividers to a spacing of 7.0 miles, then walk off the route. Each step is 1 hour of travel time. This example shows measuring the distance between two buoys some distance apart. It starts down and around a peninsula, up a channel, and into a bay. Dividers are first set to a separation of 2.0 miles using the latitude scale and then walked along the path. (1) Align parallel rulers with the line in question. (2) Move the parallel rulers without slipping to the nearest compass rose and align one edge with the center of the rose. (3) Read true orientation of the line from the outer ring of the compass rose, or read the magnetic orientation from the middle ring of directions. "Compass rose" is an unusual term for this diagram on a chart, but it is used universally, even on high latitude charts that do not include any compass directions at all on the diagram. On typical compass roses, however, you have 3 scales, an outer scale showing true directions relative to true North at 000 and a middle scale which is rotated by the local magnetic variation so it reads magnetic headings, and then a third inner ring that shows compass directions marked off in compass points (each point is 11.25°). If you want to be double sure that you did not move or slide on the way to the compass rose, you can walk the dividers back to the line after reading or marking the direction on the rose. If the parallels do not line up when you return, you will have to repeat the whole process, since you do not know if you moved coming or going. The hand traces out the line in the direction we wish to measure. The first step shown is just a trick to use dividers to help align the parallel rulers. Place a tip on the line and then slide the parallels up against the tip. Then rotate the parallel rulers back down to align their edge with the line on the chart. This method is a good way to get a careful alignment even when bouncing around in a seaway. Then use one hand to hold down the aligned ruler, and use the other hand to move the other part of the rulers away from it. This is taking the first step with the rulers. Then change your pressure to hold down the one you moved, and bring the back one up to it. When the ruler edge will finally reach the center of the compass rose, align it with the center of the rose and read the appropriate ring where the parallel ruler edge crosses it. If the light is poor or when bouncing around, it may be necessary to draw a line along the ruler edge crossing the scale and then read the scale. To read the scales, we must do just as when reading the latitude scale or any other scale. Count the tick marks in between the labeled ones to be sure we know what they stand for. A common mistake can be to count them as 1° each when they are actually 2° each, or vice versa. (2) Roll plotter to nearest meridian and place center of plotter's scale on that meridian. (3) Read line direction from the plotters scale, where the meridian crosses it. This example is the same as last example, but with a Weems plotter, rather than parallel rulers. Read in that section about the trick of using dividers to get the alignment, or in this case, a first step toward the alignment, since we can fine tune that one using this tool (see Video Notes, below). Meridians are the lines of longitudes, vertical lines on most charts. This measurement can also be made on a parallel of latitude (horizontal lines on the chart) using the diagrams on the two edges of the plotter. These plotters work very well when you have good chart table area. It is sometimes difficult to get to use them near the edge of a chart, so we always have parallel rulers at hand if needed. These plotters are very convenient, but you must use true bearings — as opposed to using parallel rulers and the compass rose, in which case you can choose which scale, true or magnetic, you prefer. When using these tools, you must have the local magnetic variation in mind at all times and make the corrections whenever you are relating to compass courses or bearings. As in last example, the finger traces out the direction we wish to measure. And, as explained in the last example, we use the dividers to align the plotter with the charted line. In this case, though, we fine tune that alignment using the thin black line printed on the plotter itself. You could use the edge of the plotter or this line, but we have found that using this line is more accurate. To do this, look through the plotter and micro-adjust the plotter orientation until the line on it coincides exactly with the line on the chart. Then carefully roll the plotter to the nearest meridian line and align the center of the plotter's compass rose scale with the meridian as shown. Read the heading from where the meridian crosses the scale. Note that the diagram reminds you with small arrows that if looking NW use the inner scale and when looking SE use the outer scale (see last frame of video). The bearing we want in this example is 320 T, in the NW quadrant. The reciprocal is 140 T, which is in the SE quadrant. This is a method found useful for many paddlers and other small craft operators that have little room for tools or surfaces to use them on. Drill a hole (if needed) in the center of a 0-360° protractor and insert a string about 18 inches long. Tie knots at both ends and use as illustrated. For some applications, the center of the protractor can be placed on your position or other reference mark, but in other examples, as the one shown here, the center is offset so the string can pass through both points of interest. The edge or some other vertical or horizontal lines on the protractor must be aligned with some straight lines on the chart, but it is rearley a problem to make this orientation. The bearings or directions are read from the protractor where the string crosses the scale. These directions will always be true directions which must be converted to magnetic if used with a compass, which is the usual case. There is no video here, just slides. Slide 1 shows general use of the tool, aligning the protractor with some vertical or horizontal reference and stretching out the string to read a direction. Slide 2 shows the alignment and the string in more detail. In this example, the plotter is used to measure the course from a plotted position to the pass between two islands. Sldie 3 shows the string crossing the protractor scale and going through the plotted position. The true direction of this course is 307 T. If the local magnetic variation were 20° East, then the magnet course would be 307 - 20 = 287 M.
The compass conversion rule is "correcting add east," where "correcting" means going from Magnetic to True. We are going the other way, so we subtract. If there is ever any doubt about this, just go to a compass rose and draw a line from center to either true or magnetic course and read the "converted course" from the other scale on the rose. In short, a compass rose is just a graphic table of compass conversions, from True to Magnetic or vice versa. (1) Double check the Lat value from original source. (2) Identify this Lat on the Lat scale on the side of the chart, double checking the tick mark spacing before hand. (3) Use plotter or dividers to transfer this latitude to chart and draw a short line in your approximate position. (4) Repeat the process using the Lon scale at the top or bottom of the chart. Draw another short line to intersect the Lat line, and the intersection is your position. (5) If this is a position fix, draw a small circle around the intersection and label this position with the time. There are numerous ways to carefully plot a Lat / Lon position. The key issue is doing it precisely. In these days of GPS, much of our position navigation has been reduced to simply plotting a position on the chart. Needless to say, we don't want to do a bad job of all we have left! But, jokes aside, this is a crucial part of navigation regardless of how we got the info in the first place. And it is one of those things that seems so easy, we might not treat it seriously enough. Which is a mistake. It cannot be done too carefully in most cases. If the plotter won't reach the region of your position as shown in the video — which it certainly won't in many cases — then we have a bit more work to do. First, on the latitude scale itself, set the dividers to the distance from the given latitude to the nearest parallel shown on the chart, and then mark that distance on the chart near the approximate longitude. Then use plotter to draw the short Lat line at that position, rolling the plotter down from that nearest parallel. Then do the same for the longitude. In this example, the first step shown is the double checking of the latitude tick mark spacing, by counting off the steps between the two labeled latitudes. Here the bold bands mark off 1' intervals from 36° 50' on up. One divider tip is then placed at the 52.7' mark and the plotter is rotated till it is parallel to a latitude line. In this case, this was performed by aligning the vertical line in the center of the plotter with a meridian on the chart. Once the plotter is parallel, it is slid up to the divider tip to mark the proper latitude, and a short line drawn in the region of the position. We know where this should be from looking at the longitude scale and the longitude we must plot. Then the process is repeated for the longitude. (1) Orient a plotter or parallel rulers with the desired direction using the compass rose. (2) Move the plotter back to the position and draw the course line. This process is essentially the reverse of the exercises shown in the Directions section. There we had a given line and used the compass rose to measure its orientation. Here we start with a given orientation, and wish to draw a line through a specific point in that direction. Generally the line is our intended course away from a known position. The course could be specified in True or Magnetic terms, but in either case it is just one unique line on the chart. The only difference is which ring we use on the compass rose. As with plotting positions, this is one of the key operations in chart plotting. We have a known position which we might have obtained from electronic equipment or from some piloting technique, and we have a known course we wish to sail which will take us to our destination. Or, we could be under sail, and we are simply plotting out our course over ground (COG) as given from the GPS. Generally it is the COG that we need to plot here since this is the way we are actually moving. The compass heading of the boat is the way the boat is pointed but is not necessarily the way the boat is moving. In this example, we have a Course Over Ground of 238M, which we wish to plot away from our 1352 position, which is already plotted. We use the dividers to help align the plotter. First use the divider tip to carefully count off the numbers on the magnetic ring on the compass rose. Again, we wish to confirm what the tick marks stand for since the bearings are only labeled every 30°. Once we find 230, we count out the next 8 degrees and then plant the point at 238M. First you have to make a plotter as described at the end of these notes. Next you must prepare your charts with a few extra meridians and parallels over the region you will be traveling, also described at the end. There is obviously some time involved in this preparation to use this method, but once completed it lasts for a long time and will speed up your accurate position plotting by a great deal on the charts that apply. 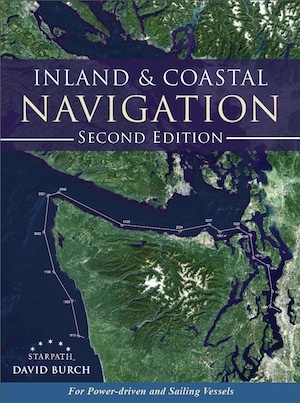 For tricky passages or for racing navigation where quick navigation is essential, this simple method has proven extremely valuable many times now since the advent of digital read outs, back in the old LORAN days. With it, and very little practice, you can plot an accurate position on a chart about as fast as you can read them from the electronics. In this example, we plot: 48° 23.25' N, 122° 33.82' W on a chart with scale of 1:25,000. This method requires a separate card, or at least corner of a card, for each chart scale it will be used with (explained below). Step 2. Slide the top edge of the card up to the nearest parallel of whole minutes of latitude of your position, in this case 48° 23'. Then slide it farther up to match the decimal part of your latitude, in this case 0.25'. Step 3. Count left, to the west, from the meridian along the top edge of the card to mark the decimal part of your longitude, in this case 0.82' and mark your position with a point. Then it is a good idea to immediately label this position with the time it was valid. How to make a "Starpath card plotter"
We call this a Starpath plotter so that this particular method is easy to refer to. There are numerous plastic plotting aids on the market, but we have not seen any like this, and we have not seen any that work as well. Furthermore, it is a valuable exercise to construct the device and plot the extra chart lines as it gets the user a bit more involved with the actual scales being used. 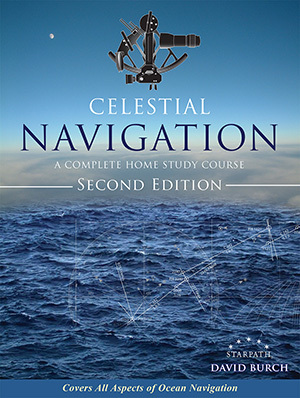 This technique was developed for racing navigation back in the days when we first had electronic positions, but no electronic chart plotting—to be used when we had to plot fast in dangerous conditions, as in rounding a corner closely at night or transiting a narrow channel in strong current. Use any piece of cardboard. Index cards work well — we have many times cut the back out of a notepad to make the cards. Next study the chart you will be using for this to see what the decimal scales are for latitude and longitude. Generally this method works well for the common scales of 1:40,000 and 1: 80,000 charts or 1:25,000. For larger scales it works even better, and for smaller scales there is not much need for this type of plotting. Note from slide 2 that you mark the latitude scale going down the right side and the longitude scale going across the top to the left. The scale should be marked in decimal degrees, which in turn means it is most convenient when the GPS output is in decimal degrees — as opposed to degrees, minutes, and seconds, which is awkward to plot. A separate card or corner is needed for each chart scale used. Also the latitude and longitude scales must be divided into tenths, which is not given on all charts. The nautical miles scale will do it for the latitude, but you will have to interpolate the longitude on some charts, with 6" = 0.1' etc. Since most charts do not have parallels and meridians drawn every 1', we usually need to add extra lines to use with this plotter. Once added, it is helpful to label them in the vicinity of your travels. Needless to say, we should double check these labels with the chart scales themselves. Once prepared, this is a fast, convenient, and accurate way to plot. Time spent in preparation and practice should prove rewarding. Again, though, this is intended for fast plotting in somewhat special circcumstances. For most routine navigation, simple use of parallels and dividers, covered elsewhere in this plotting tutorial, should do the job just fine. (1) Mariner’s Weather Checklist Before Departure ...an absolute must do list! (2) Weather Maps—Where To Get Them and What We Get? ...the next item below shows what the maps look like. (4) Weather by Satellite Phone ... covers non-commercial options. (5) Reading and writing on weather maps ...an index to a series of videos focusing on confirming GRIB forecasts with NWS maps. 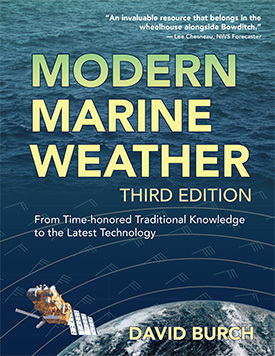 (11) Marine Weather Services Chart — How to Make Your Own ...no longer printed by NOAA but still a fundamentally important resource. Is the Moon Waning or Waxing? Periodically I read through one of our online course discussion forums, which has been accumulating over the past 15 years—sort of like skimming through a dictionary— and very often I run across extended notes buried on a special topic there that have long been forgotten, but deserving of some fresh air. 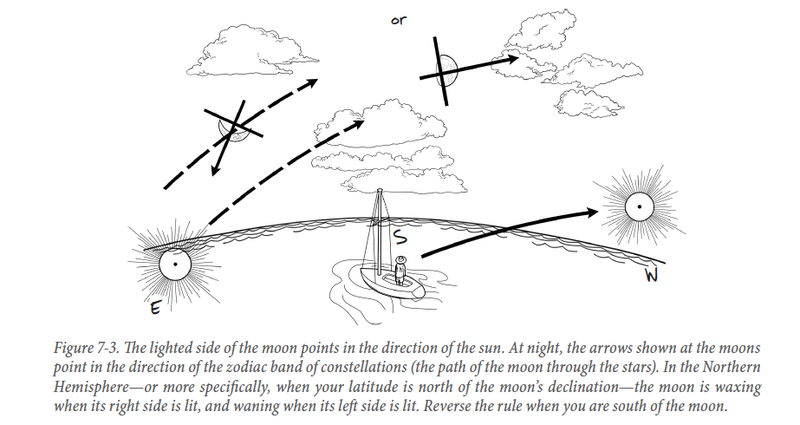 This is an example, namely the question came up in cel nav course about deciding if the moon is waning or waxing. So that of course first got the standard cel nav treatment, but following that were the parts that were a bit more interesting. We are back from our Alaska training cruise (will write about it later), and on watch till we leave for the Pacific Cup Yacht Race on June 28. Then again off watch for 2 weeks. Moon phases, appearances, and terminology issues are always puzzlers. There are definitely some things that change with location, but most are the same. It is likely more an issue of which way are you looking to see the moon, rather than which hemisphere you are in at the time. At 2° N with a moon dec of 25° N, for example, i am looking north to the moon at mer pass, rather than the more common view south to mer pass from the NH. (1) the words "waning" and "waxing" have their same English word meanings always, everywhere. Waning getting smaller, waxing getting bigger. (2) the moon is waxing when it is moving away from the sun and waning when moving toward it. This is the key point and also one that is not so easy to picture... without a picture. (3) the moon is full when it is precisely on the opposite side of the earth from the sun (GHA sun - GHA moon = ±180°), and there is no moon or a "new moon" when the sun and moon are on the same side (GHAs are equal). 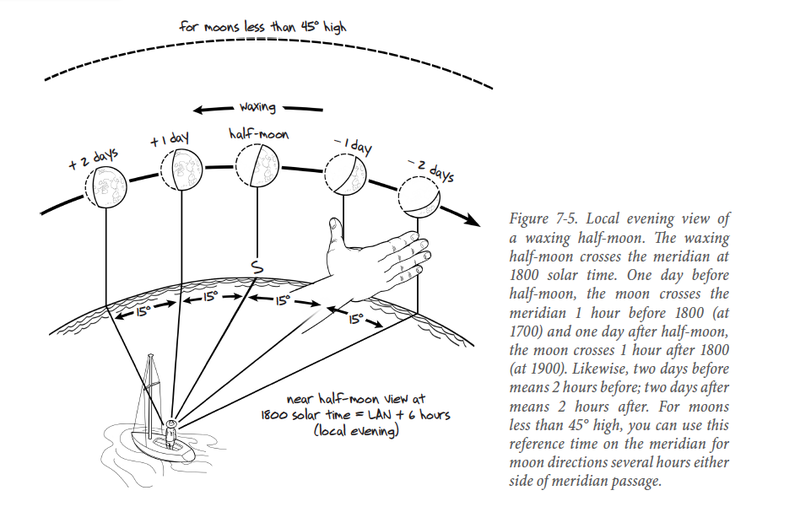 (4) the moon moves eastward through the stars at about 12° per day (360°/30 days). This is true always, everywhere. If you see the moon next to Aldebaran bearing 190 M at 10 pm, for example on one day, then the next day at 10 pm you will see Aldebaran at roughly 191 M (sun moves 360°/365 days) and the moon will be 191-12 = 179 M.
(5) the side of the moon that is lit up is the side nearest the sun. If you draw a line connecting the "two horns" of the moon — or equivalent points for other phases — and then draw a line perpendicular to that, you have a line pointing toward the location of the sun. The above (5) statements are always true from any location, any time. And from these we should be able to answer all questions about moon phases. (1) When looking south to a body's daily motion, we see it's east-to-west motion as being from our left to our right, whereas looking north to view the east-to-west motion we see it moving from our right to our left. (2) The shape of a crescent moon changes from "C" to "D," or vice versa, when looking to the north versus the south to see the moon. This is consistent with all of the above, but when it comes to making up rules on what the moon is doing (waxing- or waning-wise) based on what we see, such as the note below on whether or not the moon is "telling the truth," then we must qualify these with which way we are looking to see the moon, which in turn is often over simplified to specifying what hemisphere we are in. "The Moon is always lying"
There is a French saying that "The moon is a liar" (La lune est menteuse), which can be used to determine if the moon is waxing or waning. I have known of this for some years but never knew what it meant, nor how to apply it. Recently a student mentioned in passing that it must mean that the shape of the moon is a letter and the letter tells us what it is doing, but it tells us wrong! Well, indeed, it is as simple as that. 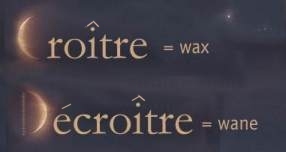 "Croître" means "to wax" and "Décroître" means "to wane," as shown in the figure. When the moon shows us a "C" (croître, waxing) it is lying, it is not waxing but waning, and vice versa when it shows us a "D" it is not décroître but croître. Don't believe me; I am lying. —Thanks to Capt. Jean Faubert for filling in the details on this saying, and confirming that many French-speaking navigators have indeed learned it this way. When I explained this discovery to my teenage daughter [actually not a teenager any longer as I re-post this today], who I thought might be interested since she studies French, she said, "Fine, but isn't it simpler to just recall the Celtic Goddess symbol?," which she immediately sketched and explained: the waxing moon on the left represents maiden; the full moon in the middle, mother; and the waning moon on the right, crone. The symbol is unforgettable, and I had to agree with her. Thanks Britt.